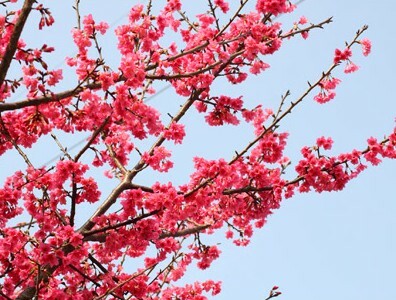 The Taiwanese Cherry is a native species in Taiwan.The tree can grow up to six meters in height.The leafless tree blossom during spring season and is covered with crimson flowers.The flowering periods are between late January and March. There are currently about 50,000 Taiwanese Cherries planted in New Taipei City and are distributed in various areas: The 101 county route in Sanzhi District, Denggong Road in Tamsui District, Cherry Boulevard and Sankong Spring in Shulinkou, Wulai scenic district and industrial roads, Pingxi Forest Recreation Park roads, Jinshan historical old street, Shiding Xiaogetou (9 county route to Yilan, around 22-26k), Sanxia Chajiao north 109 route. The cherries deliver fascinating views during spring time.